Patience is key, right? Wrong. In today’s fast-paced online business world, everyone wants a website that will deliver a fast and great user-experience, regardless of the niche or industry. Websites that give off an amazing first impression are likely to see returning customers – therefore increasing the company’s overall success. Never overlook to the importance of website load speed. When you reach a website that takes minutes to load, you’re likely to get frustrated. And, when you get frustrated, do you take the time to stay on that page and continue to wait? No way. Instead, you’re likely to find a similar website that shows exactly what you’re looking for, with the bitter taste of the previous site still lingering. People don’t have the patience to just wait around for a website to load on their smartphone or computer. The longer you force them to wait, the more you have to lose – i.e. money, interest, and relevancy. When Google implemented website loading speed as part of their algorithms back in 2010, everything changed. Speeding up websites is not only important for business, but it also directly impacts how well you rank in the search engines. 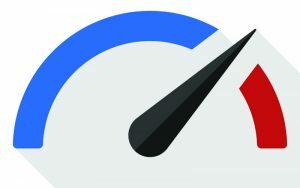 Google knows that referring people to slow-loading websites will essentially create chaos on their user-experience, which is why they made loading speed such a critical aspect of their ranking system. Value your website’s loading speed to the point where you’ll want it to take no longer than 3 seconds for everything to come up. A handy tool you can use to check your site’s speed is Google Page Insights. How Can You Increase Your Load Speed? Websites often get weighed down by unnecessary features that you think might be useful for customers; when in reality they never use them. Not all websites take this into account when creating a website. One of the most common factors is the type of template that you choose for your website. While the cost of a template is much less than a custom designed website by renowned designers, most templates often come with built-in features and functionalities that may not be crucial to your site’s success. These extra features means that it’ll take more time to load the website, therefore forcing your potential customers to wait. Now, this doesn’t mean that you need to complete abandon templates. Rather, pick and choose which add-ons and features you really need and get rid of the rest. Always remember, your website will run faster when it doesn’t need to load up and unnecessary code. Another underrated aspect that many website owners fail to realize is image sizing. Most high-resolution images are large files, and while they may look glorious, the weight of these images is likely to slow down your page. Downsize these images by reducing the quality or overall size – be careful that it doesn’t start to show each pixel, you already know how bad that’ll look. Additionally, if you’re using carousels or sliders, the sheer amount of weight these add-ons carry is enough for you to say goodbye to them – especially if you didn’t alter any of the images. You don’t need to strip your website down to nothing in order to get the fastest loading speeds. Instead, prioritize what makes your website fully functional and essential for a great user-experience. This will help your potential customers find exactly what they’re looking for without having to deal with the nuances of waiting minutes. Blog submitted by WebDesignExpress.com. With affordable Web design in Glendale, Ca, Web Design Express is trusted by hundreds of businesses nationwide for optimization of WordPress, and eCommerce platforms.